The main conclusion of our manuscript was that uncommitted peripheral invariant NKT (iNKT) cells can acquire IL-17 secretion upon activation in the right microenvironment (1), in addition to the existence of a thymic-committed population of IL-17 secreting iNKT cells as previously reported (2). Michel and Leite de Moraes revisited our findings using ROR-γtGFP reporter mice that were not available in our laboratory when we first performed our study. In their Letter to the Editor, it is claimed that the majority of IL-17+ iNKT cells observed following stimulation under IL-17–promoting conditions are derived from expansion of pre-existent ROR-γtGFP precursors. However, given their low frequency, an exceptional proliferation rate would be necessary for those rare precursors to dominate the culture after four days. To directly address this issue, we FACS-sorted equivalent populations of iNKT cells from ROR-γtGFP reporter mice (Fig. 1A). We then cultured ROR-γtGFP+ cells with unfractioned NK1.1+ iNKT cells from Thy1.1 mice at a 1:1 ratio (Fig. 1B, left column). These cultures confirmed that ROR-γt+ precursors have an advantage regarding survival and IL-17 production under IL-17–polarizing conditions (as we have suggested in our manuscript, where this proliferative advantage is observed even in the absence of added TGF-β). But the key experiment is the coculture of unfractioned NK1.1+ iNKT cells with a sorted population devoid of ROR-γt–expressing precursors (Fig. 1B, right column). If the hypothesis that IL-17 secretion derives predominantly from precommitted ROR-γt+ precursors was correct, most IL-17+ iNKT cells should be Thy1.1+—the only population with ROR-γt+ precursors. However, our data clearly show that the frequency of IL-17+ iNKT cells is similar in both Thy1.1+ and Thy1.2+ populations. These data conclusively show that uncommitted (ROR-γtneg) iNKT cells, despite expanding and surviving less than RORγt+ precursors, make a significant contribution to the overall IL-17–secreting iNKT population, possibly due to their vast abundance in comparison with the rare ROR-γt+ precursors. Uncommitted ROR-γtneg iNKT cells can acquire an IL-17–producing phenotype. (A) Splenic iNKT cells were identified using a CD1d/PBS57 tetramer and TCRβ Ab. 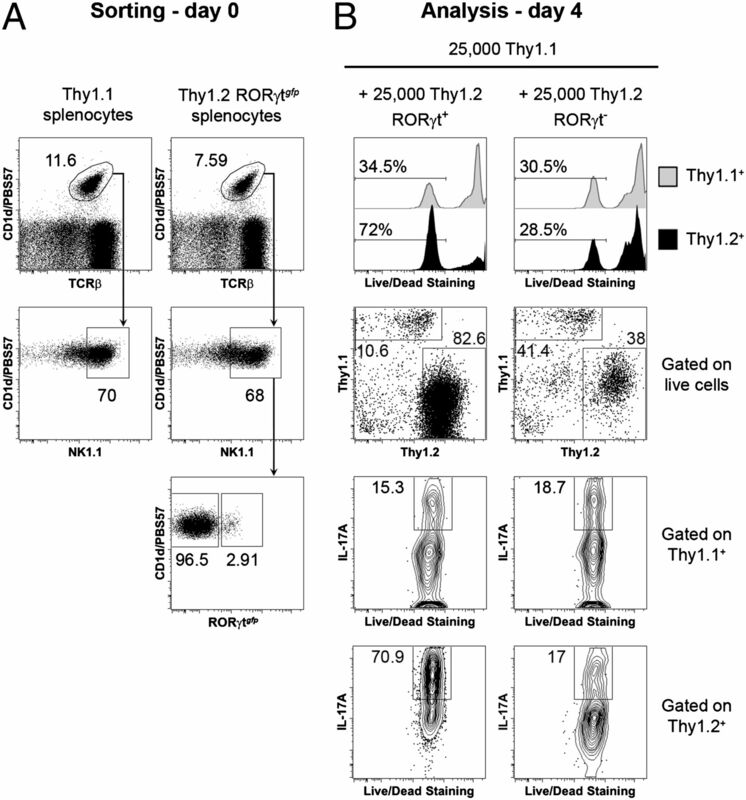 The ∼70% iNKT cells with higher NK1.1 were sorted from congenic Thy1.1 and Thy1.2 ROR-γtGFP mice as NK1.1+ iNKT cells. In addition, the cells from Thy1.2 ROR-γtGFP mice were sorted as ROR-γt+ and ROR-γtneg, as indicated. (B) Thy1.1+ iNKT cells were cocultured with an equal number of sorted Thy1.2+ ROR-γt+ (left column) or ROR-γtneg (right column) iNKT cells in IL-17–polarizing conditions (plate-bound anti-CD3 and anti-CD28, with IL-1β, TGF-β, IL-6, and anti–IFN-γ) as described elsewhere (1). Four days later, the cells were stimulated for 4 h with PMA + ionomycin and analyzed for cell viability using a Live/Dead fixable stain kit (Invitrogen; top histograms). Subsequent analysis was performed within live cells. The top dot plots show the frequency of live Thy1.1 and Thy1.2 iNKT cells. The contour plots at the bottom show the frequency of IL-17+ cells within the live Thy1.1+ or Thy1.2+ cells. These experiments were performed in quadruplicates and representative dot plots are shown. The observation that ROR-γt+ precursors survive better than ROR-γtneg iNKT cells under IL-17–polarizing conditions is an original observation by Michel and Leite de Moraes, which we confirmed (Fig. 1B, top histograms). However, we reproducibly observed significant survival of ROR-γtneg iNKT cells (comparable to the survival of unfractioned Thy1.1+ iNKT cells). We cannot offer a conclusive explanation for the extremely low survival of ROR-γtneg iNKT cells (∼1%) reported by Michel and Leite de Moraes. One possibility may be the use of a different culture medium. Unlike Michel and Leite de Moraes, we have used IMDM, and it has been reported that differences in IMDM and RPMI can significantly impact CD4+ Th17 polarization (3). Overall, the use of ROR-γtGFP reporter mice allowed us to confirm that, in addition to “natural” thymic-derived iNKT17 cells, uncommitted iNKT cells can be peripherally induced to secrete IL-17.
. 2009. Natural agonists for aryl hydrocarbon receptor in culture medium are essential for optimal differentiation of Th17 T cells. J. Exp. Med. 206: 43–49.